The TY Mini-Med programme is designed to give the students from all over Ireland the opportunity to experience what it is like to train and work as a doctor. Although CCS was unsuccessful in the Royal College of Surgeons Mini-Med lottery, some sections of the TY Mini-Med 2017 programme will be live streamed during the course of the week of 9th – 13th January 2017. Please see attached the live stream programme, please note that this is subject to change. Students must also have Google Cardboard VR glasses. Please preload Smartphone with the appropriate application (free of charge) depending on the phones device below. 1. Please download the Cardboard (by Google Inc) application from the Google Playstore. 1. Please download the Google Cardboard (by Google Inc) on your device's apple store. Adios to our amigos españoles, Jaime, Teresa and Blanca! It was lovely to have you with us in TY! iFeliz Navidad to you and to Laura! Laura, come back to us safe and sound in January! The 2016/17 edition of the 'Cassini Scientist for a Day' competition is now open to entries. The competition is designed to give participants a taste of life as a space scientist.Students are invited to submit a 500-word essay explaining their choice of one of three targets imaged by the Cassini spacecraft, in orbit around Saturn, over the past few years. To enter the competition school students (10 – 18 years old) need to find out as much as possible about the beautiful planet Saturn, its fascinating features, and mysterious moons. Students must then choose one of the three targets imaged by Cassini and write an essay to justify their choice to a panel of experts. Winners of the competition will receive a special ESA goodie bag and certificate. In addition, the winning essays will be published on the ESA website. The closing date for the competition is 23:59 GMT, 3 April 2017. The Uniform offers a range of choice while trying to minimise cost. (i) School Jumper / Cardigan with School Crest. (ii) Light Blue shirt: Parents can choose where to purchase. (iii) Grey ( Charcoal ) trousers / Slacks / skirt: Parents can choose where to purchase. Leggings / Jeggings not acceptable. Skirt material consistent with trousers. (iv) Black Shoes: Regular Sole Shoes – No Runners. (v) Choice of School Jacket or School Blazer with crest purchased from school. ( If not wearing a school jacket / blazer no other jacket is allowed) School HalfZip for Sports. (vii) Due to discipline and security issues the Board has banned the wearing of ‘ Hoodie’ jackets for all pupils from September 2005. At the meeting of the Board of 2nd December 2016, the Board considered issues relating to the school uniform. The Board agreed that clarification was needed and the definition of school trousers would EXCLUDE leggings, jeggings and that skirts would have to be of material consistent with trousers and be a required length. Blue Cardigan with School Crest would be acceptable as an alternative to the school Jumper with Crest. The amendment would be advised to all partners and the Student Council would be asked to support the implementation of this policy. The amendments to the Uniform Policy would be effective from January 2017 after the information was relayed to the school community. Amendment to Uniform Policy specific to P.E. All students must wear appropriate gear for their own safety and the safety of others while participating in P.E. Tracksuit bottoms, which are not too wide, are a safe length and not trailing on the ground. An adequate T-shirt, with sleeves and covering the torso. Shoelaces must be properly tied and not tucked into the sides of shoes. No chewing gum as this poses a choking hazard in any form of physical activity. No jewellery – ( including watches ). All body piercing is banned under school rules. is also acceptable. All pupils must wear football boots for Gaelic, Soccer and Rugby outside. The P.E. teacher will be entitled to insist that a pupil change into school gear if he/ she presents in unsafe / unacceptable gear. ** Makes all pupils equal creates a clear school identity. ** Reduces expense to parents of regularly having to purchase clothes for their children – often at the dictate of fashion. ** Pupils can clearly be distinguished from intruders and makes the school a safer environment for all. ** Represents a visible commitment to the rules and policies of C.C.S. ** Establishes a code of dress appropriate to the image the school wishes to present. To properly enforce the Uniform Policy, the school is again dependent on the support of you, the parents and guardians. It is neither possible nor practical for the school to operate exceptions to this policy, though we acknowledge that there will occasionally be genuine reasons why your child may arrive in school not wearing full uniform. The school will offer replacement school trousers and jersey to pupils presenting out of uniform. The Principal / Deputy Principal will deal with all uniform matters at 12.35p.m. that have not been addressed first thing in the morning. Pupils will not be admitted to class in jeans. Pupils are expected to adhere to the full school uniform as defined in the School Journal: the school uniform reflects the sense of belonging to the school community and parity of esteem in which each individual is held. Notwithstanding genuine reasons, note or telephone call to confirm reasons why a pupil is not in uniform, the school will operate a standard supervised detention at lunchtime for pupils not co-operating with full uniform. Pupils may do homework or study during this time. Pupils who have a genuine reason for being out of uniform should bring a letter signed by a parent/guardian to the teacher in charge of uniform. This must be done first thing in the morning before 9.00a.m. School Jersey / Trousers will be offered to pupils presenting out of uniform. Persistent disregard for uniform will be addressed through the Code of Behaviour and the Board will deal with pupils refusing to co-operate with the policy. TYA & TYB - Period 1 - after you get your roll taken! Policy: It is the policy of the Board of Management of Carndonagh Community School that all of its workplaces and campus are smoke-free and that all pupils and employees have a right to work in a smoke-free environment. Smoking is prohibited throughout the entire school buildings and campus with no exceptions. This policy applies to pupils, parents/guardians, employees, consultants, contractors, customers and visitors. ALL CIGARETTES INCLUDING E-CIGARETTES ARE BANNED. The Board of Management at the Meeting of 2nd December 2016, approved the following amendment.
" Due to the associated Health & Safety concerns, the exploitation of pupils, the unravelling of the school's success in ensuring smoke free toilets and the loss of Administrative time, the Sanction for possession / use / sale of e-cigarettes/vapes will be an automatic 2 day suspension with parents requested to meet Principal / Deputy Principal(s) and confirm co-operation prior to return of pupil. Further breach would be a matter for the Board of Management." The Sanctions will be effective from Monday 12th December after the school community has been advised of the Board's decision. This will be highlighted through Class and Subject teachers informing pupils, Year Group Assemblies, Notice on School website, Letter and Text Messages to Parents / Guardians. Automatic 2 day suspension with parents requested to meet Principal / Deputy Principal(s) and confirm co-operation prior to return of pupil. Further breach would be a matter for the Board of Management. IT IS THE ENTITLEMENT OF ALL PUPILS AND STAFF TO OPERATE IN A SMOKE FREE ENVIRONMENT. Approved by Carndonagh Community School Board of Management, 2nd December 2016. Interested pupils should pick up an information leaflet from the table outside Mr Liam Harkin's office in the Careers Suite. 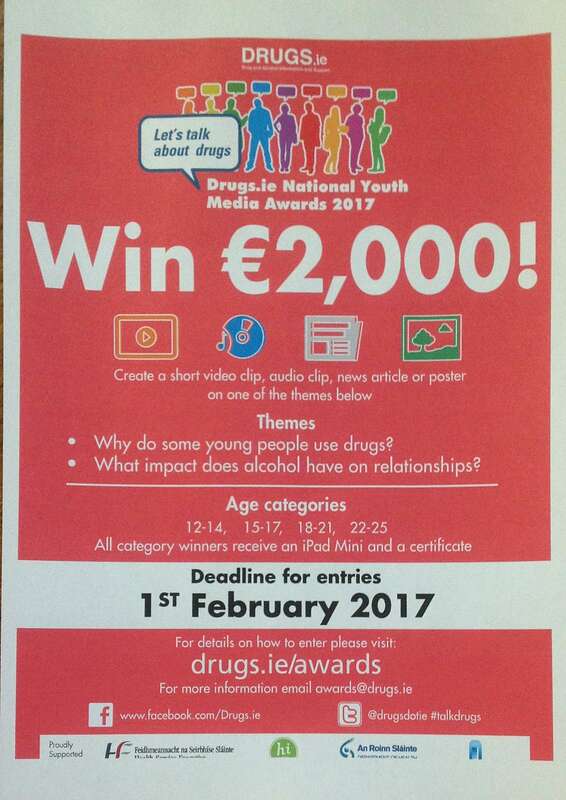 Drugs.ie “Let’s Talk about Drugs” National Youth Media Awards Competition 2017. Bláthnaid Treacy's from RTE officially launched the competition last month in City Hall Dublin.Fourth year students from your school might be interested in entering this years competition. The competition is primarily aimed at secondary schools, colleges and youth clubs nationwide and is supported by the Department of Health, the HSE, the Ana Liffey Drug Project, Healthy Ireland, The Union of Students in Ireland, The Irish Second Level Student Union and the Drugs.ie website. Drugs.ie is Ireland’s National Drug and Alcohol Information and Support Website.The drugs.ie site has in excess of 120,000 unique Irish visitors each year and over 500,000 international visitors. 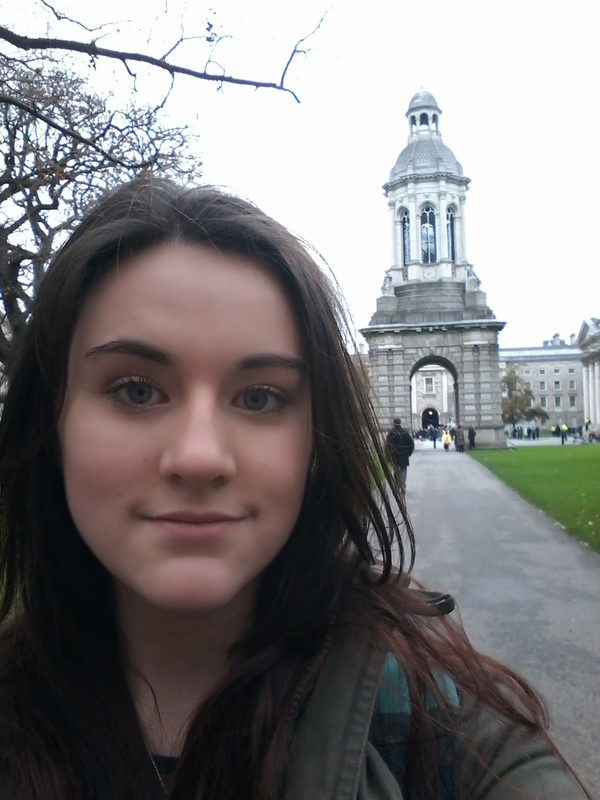 This annual drugs education competition aims to help students explore and understand various issues relating to drug and alcohol use in Irish society. To enter, students are asked to research topics or share their personal experiences and create either: a short video, an audio podcast, a news article; or a poster on one of the following themes: (a) Why do some young people use drugs? (b) What impact does alcohol have on relationships? The age categories for entering are: 12-14; 15-17; 18-21; 22-25. By getting involved, students can explore the issue of drugs and alcohol from a constructionist learning experience. This can have a more meaningful impact on their own understanding of the issues - as this type of learning experience is effective when people are also active in making tangible objects in the real world. In turn, schools can take a proactive and innovative approach to raising awareness and understanding of the issues; issues that affect the lives of many young people in Ireland. On this basis, we are asking all schools to encourage students to enter - as individual entrants - or as a group project. 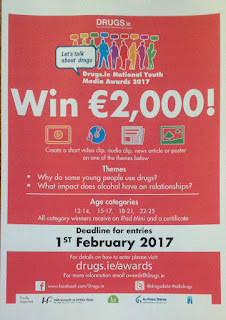 Video, audio, article and poster entries created by young people as part of the competition are available on the drugs.ie site.These are useful resources which can be used to raise awareness among students in schools. The competition has collaborated with The Irish Times Student Hub (http://www.irishtimes.com/student-hub). As a result winning entries will be considered for publication on Irish Times Student Hub (and future 2nd level hub) subject to editorial approval. We are looking at the possibility of offering a Millinery Workshop by Award Winning Milliner - Suzie Mahony Designs - www.suziemahonydesigns.ie to interested TYS (maximum 20). TYS with an interest in Fashion Design or Millinery Design and who are interested in taking part should declare their interest by giving their name to Ms McGeehin in R.132. Pupils should be aware that there may be a fee for participation. The CCS Deadline has been extended until Wed 25th Jan 2017 . This will give applicants an opportunity to work on their entries during the Christmas holidays . Your teacher will issue you with your new timetable during this class. Enjoy your work experience! Remember to make a little gesture like bringing biscuits or chocolate sweets for the tea-break on your last day! Thank you. Enjoy the Hallowe'en holidays, everyone! Be careful when you are out and about, especially as the nights draw in. Have a scary one!!!!! This annual drugs education competition, primarily aimed at secondary schools, colleges and youth clubs nationwide, aims to help young people explore and understand various issues relating to drug and alcohol use in Irish society. To enter, young people are asked to research topics or share their personal experiences and create either: a short video, an audio clip, a news article; or a poster on one of the following themes: (a) Why do some young people take drugs? (b) What impact does alcohol have on relationships? The age categories for entering are: 12-14; 15-17; 18-21; 22-25. By getting involved, young people can explore the issue of drugs and alcohol from a constructionist learning experience. TYS who have signed up for the Red Cross First Aid Course are requested to bring their €20 to Mr McGee on Wed 9th November. Mr McGee will be available to collect the money in his office in the Gym from 10.25 a.m. to 10.35 a.m. The course starts this Thurs. It will be run consecutively in 4 groups of approx 20 pupils for 2 hours per week for 6 weeks during PE class time. Places for each group will be allocated on a first come first served basis. There will be a Gaisce meeting tomorrow, Wed 26th Oct, from 1.00 to 1.15 in R.132. 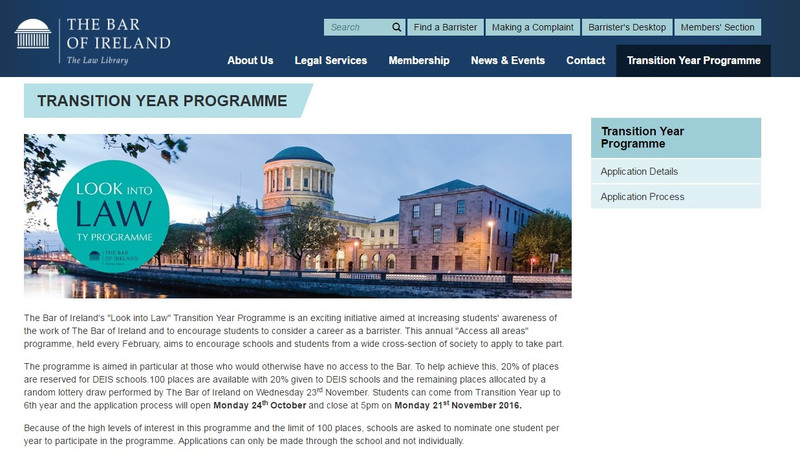 It is important that everyone who has signed up for the Gaisce challenge be present. We have had to postpone SHARE until the Spring because of the possible strike days ahead. The latter will impact on all aspects of school life, including TY residential trips. We are very sorry! Some news just in...Congratulations to Caiti Farren and Adam Mullins who have been chosen to represent CCS at the TCD Physics Experience in November. - Nabla McGeehin, TY Co-ordinator. Hopefully everyone had a great day on Wednesday at the Roadsafe Roadshow in Letterkenny! Well done, Jordan! Eileen Magnier was well impressed! Please take on board the message of the Road Show. Stop and think before you make a decision that could change your future and that of your parents. Life is for living. Ms Elaine Farren needs TY assistance with a Numeracy Project every Tue - last 3 periods during November and December. TYA Ben Nelson, Laura McGeoghegan, TYB Jason Lynch, TYC Caoimhe Ruddy, TYD Ellen Keyes and TYE Aisling McCarron. Please call to see Ms Farren if you are passing her classroom in the 3rd Corridor next week, for further information. Do not ask out of class to see her!!!! There will be other opportunities for TYS all through the year. You will get your chance! As you know, Mr Fiorentini is very supportive of TY and of TY Mini-Companies. He is however, a very busy man and can't be available to everyone all the time. Please make an appointment with Veronica early in the week if you wish to speak with him about your mini-company. In this way, you can be sure of his undivided attention. Thank you for your cooperation. We need two candidates from TY to represent CCS on Donegal Youth Council. See poster on TY Noticeboard on the mall. We are currently seeking nominations for election. If you are interested in being a member of Donegal Youth Council, please come and see me in R.132 a.s.a.p. This is a wonderful opportunity to improve on your communication skills and to work with other talented young people. The training is excellent. Think of your C.V.! Greetings all!! Very warm welcome to 123 TYs who will hopefully have a wonderful year. I will be making contact with you through this blog, your class teachers and the TY Noticeboard in the mall.